Vizianagaram, Apr 08: Serial offender Nandamuri Balakrishna has done it again. He has beaten up an enthusiastic fan when he approached him during an election campaign on Sunday in Cheepurupalli in Vijayanagaram district in Andhra Pradesh. He ran after that Telugu Desam party worker and grabbed him by the collar and beat him up. This incident took place on the main road in the town with in the presence of hundreds of party workers. 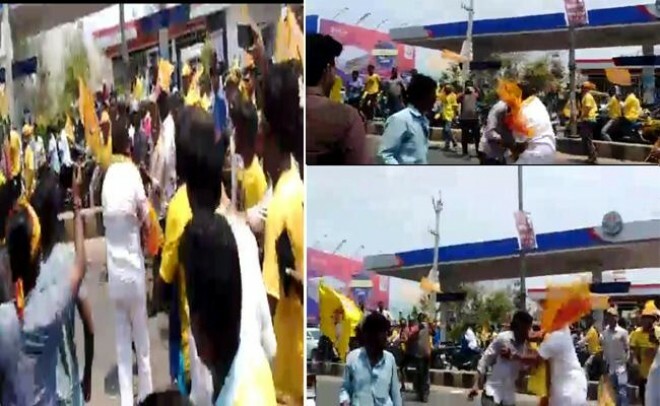 It is not known what made Balakrishna to indulge in such dastardly act but the party cadre and leaders who were participating in the campaign rally were really shocked with his rowdy behavior. "This guy must be mental case", a Telugu Desam party leader commented in the rally seeing Balakrishna’s act. Balakrishna is infamous for beating his fans in public and abusing them. Three days ago, he threatened a fan in Hindupur to kill him if he would not get a majority of 60 thousand in the ensuing polls. Beating his fans and his party cadre only raises questions about his state of mind.